"Atom's patented Electronic Ignition System was originally made for the Atom Chainsaw. Patents have now expired but its (previously patented) circuitry is now used by others on many engines in Europe, USA and Asia. The Atom Ignition Module was also developed as a spare part to replace mechanical breaker points and condenser for magneto ignition engines, and until Atom's production ceased in 2005, many millions had been sold worldwide." You used to see their modules for sale at lots of stores, even K-Mart and Wal-mart. My search with Google only turned up a couple sources anymore. I just bought some of the Blue modules to play with from Bantasaw in Canada. You have to wonder how many they have left if they stopped making them 4 years ago. Conclusion.....It appears that the Blue Atom electronic ignition could be a satisfactory back up to the points and condenser. Installed in parallel to the points at least it gives an other option. I intend to use them. As for the difference in your full throttle RPM, you might want to adjust the carbs to see if you can get them within 5-100RPM's of each other. Currently you are 400-500RPM's apart between the two engines. If a carb adjustment doesn't do it, then you'll need to look at other options. Thanks for the update! It is kind of curious though that the engines kickback worse with the Atoms, as one of their features is supposed to be less of it. A big problem we would see with the Rotax 185's was ignition failure due to crappy capacitors, not so much the points. But when the capacitors (condensers in motorhead speak) start going bad, they cause the points to pit. If that doesn't actually kill the ignition, it does cause a change in timing and a poor spark. A completely failed capacitor will just about totally kill the spark. I can't tell you how many times I've been told that someone's engine has spark but just won't start. When we check it out, we find the spark is present but very weak. A pitiful weak spark is not enough to start one of these engines! They need a nice fat one to do the job. The CDI units from Wildfire may be wonderful, and help keep the internals cleaner and the engine running in tune longer, but the price is too dear for many of us. At less than $25 each, the Atom modules seem like a nice compromise. I just want to get rid of the potential point and cap problems. I've had wonderful reliability with the Atoms over the years, and feel that they should potentially be very reliable on the old Rotaxes. i still have my contacts at ducati energia in italy who were willing to do a bulk run for us. i put that project on the backburner due to not enough interest. I need 100 engines worth of equipment for them to do a run. and i think the cost worked out to $100 per engine for the stator plate & coil, and the CDI coil... i still have my old list of those interested, but if you are ever thinking of upgrading, shoot me and email and when i get close to 100 i'll get the ball rolling. Pete I'd be really interested to do testing with an Atom myself. This is probably how I'd go about it. First I'd fine tune a set of new points (and condenser) to .016-.017 BTDC (~4.0-4.5mm) with a top dead center guage and multimeter. Note: I always change points and condensers as a pair. Second tune a fresh carb (new kit) to the Wajax Rotax engine manual spec. 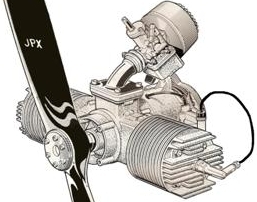 Initially turn (L) out 3/4 to 1 turn, set (H) out 1-1/4 to 1-1/2 turn, adjust idle set screw so it's off of contact with the throttle stop lever and then turn it inward 1 turn so carb shutter is slightly open. Running on Points I'd start the engine, warm it up and fine tune (L) as close to 1800-2000 rpms as possible without going much over 2000 rpms or below 1800 . Use the idle set screw to achieve what you can't get with the (L) adjustment. For example if I can only achieve 1780 with the (L) adjustment then the set screw is tweaked until the engine is idling somewhere around 1800-1850-1900-2000 range. With the engine running at full power adjust (H) to achieve max possible revs and then re-adjust (H) by slowly turning CCW to the point just before RPM loss is noted (usually less than 1/2 turn). Check: The engine should go from idle to full power almost immediately with no hestitation. Any bogging or loafing indicates a problem. Now back to idle. The engine should be "Popping and Shaking" (Jumping and Vibrating) at idle (1800-2000) when set up according to the manual with points. Everything I've ever seen and experiened say that's how these engines are supposed to run at idle. I've never seen a smooth idling Rotax 185 to date. I fear that any smooth idling engine is one that is going to wear out early and be prone to failure. I can't confirm that however because I've never seen a smooth slow idling 185. That's not how these engine run with engine manual directed mixture settings. I have to remember that just because an adjustment of the carb will let the engine run a certain way that doesn't mean it's correct. The engine could care less about how fire gets to the sparkplug (points, CDI, Atom, Nova) but it does care about the mixture it's drinking. OK these things done now swap over to the Atom and see how the engine runs. If there is a great difference between performance of the engine running on points and the engine running on the Atom then something must be amiss. If the engine runs about the same or better with the Atom I'd feel pretty confident about further testing. Shannon is absolutely correct. Idle should be set between 1800-2000. You should be printing out your very own copy of Shannon's info for your records. That is exactly the way you should be setting the 185s up. My 185's idle at 1900 and yes they shake, but its not like their coming off the nacelle or something. They have a little shake and thats fine by me. I have instant acceleration from idle to full throttle and thats what I like and exactly what you want just as Shannon has explained above. Besides, at 1900rpm, its not like the plane is trying to take off. Its not even enough to make the plane move with my feet up. So for you to want to try and get the idle down, I dont understand the purpose really. Set the engines and carbs up properly and you will be doing yourselves a huge favor. Great instructions Shannon. Thanks for taking time to post this for the group. JPXman @ Apr 16 2009, 02:24 AM wrote: i still have my contacts at ducati energia in italy who were willing to do a bulk run for us. i put that project on the backburner due to not enough interest. I'm still in if you can set us up with CDI systems in the $100-$150 neighborhood. I'll up my commitment to 5 units too. Have you heard from any of the new guys? Don't they know what a great deal that would be, and the advantages of CDI as far as resistance to spark plug fouling, cleaner operation (less de-carboning sessions), smoother throttle response and maybe even a tad more power? Come on, guys, if you think you may ever want to do this, commit now or our chance may never come!